78 I WRAPS I 2015 p r o d u c t i o n & i n s ta l l at i o n wrapping a vehicle to protect the OEM paint. In many cases, the leasing company makes a profit after three years (including the price of the install/material) so they are driving the market. In Australia, which is a very healthy market for installs, fleets are not pushed at the same volume as in Europe. The reason for this is that the leasing business model is different. The large companies sublease their vehicles to individuals, so it's up to the driver to decide if the vehicle gets wrapped. These individuals don't understand the value of protecting OEM paint, and so opt to get some cut vinyl letters/shapes put on as they think it's cheaper. Color-change wraps have only really been in the U.S. for about three years, so I think that the massive volume, like Europe with fleet wrapping, is just around the corner. In smaller countries like Ireland, fleets aren't getting wrapped at any kind of scale simply because the population is only about four million. Full print vs. color change vs. partial When I first moved to the Netherlands, I saw myself picking up where I left off in New York City—which was doing large volumes of full-print wraps. 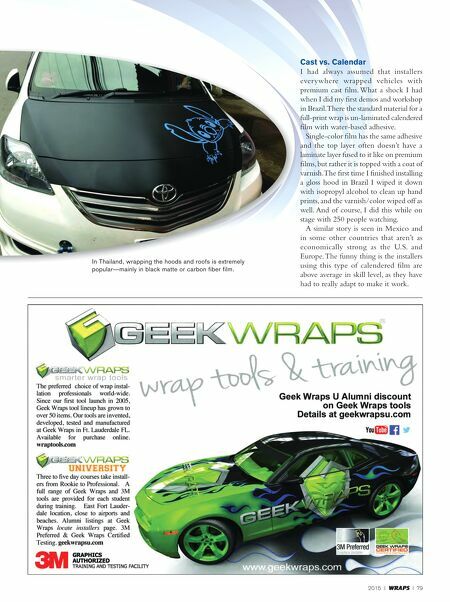 When I was looking for work, a well-established installer told me that the Dutch don't do full-print wraps. Apparently they are too loud for their culture. Instead, they put on a single color with some cut vinyl shapes/ text over the top (plus it's cheaper than a full print, so it's more cost effective, which is very Dutch as well). Sure enough, out of the 1,000 cars I have wrapped in the Netherlands, only 5 percent have been full-print wraps. Still, that hasn't stopped me from wrapping my own car in loud prints like camo, leopard and art. I can get away with it because I'm "That Crazy American." In Thailand, I rarely see a full coverage vehicle wrap. 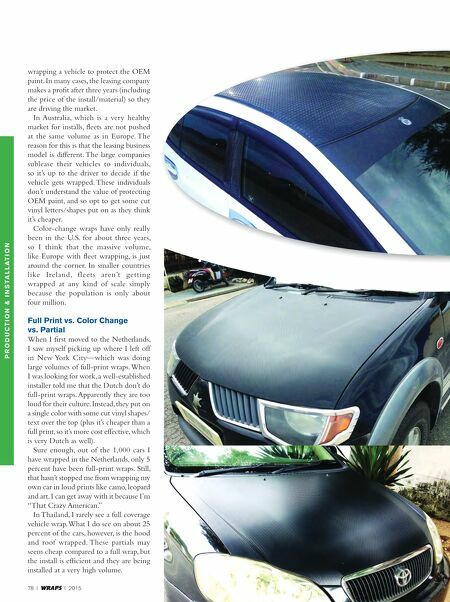 What I do see on about 25 percent of the cars, however, is the hood and roof wrapped. These partials may seem cheap compared to a full wrap, but the install is efficient and they are being installed at a very high volume.